This blog post is waaaay overdue because I started writing it before I left for Cali, but then I didn't get a chance to finish it and it got bumped aside amidst all the vacation-blogging. 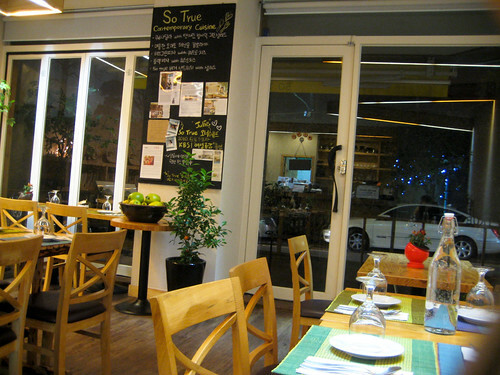 But now that I'm back, it's time to talk about one of my new favorite Seoul restaurants: 'So True.' 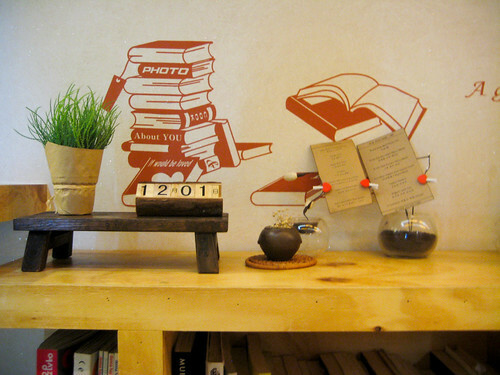 I visited this cafe last year just for coffee and kept wanting to go back, but didn't get around to it. 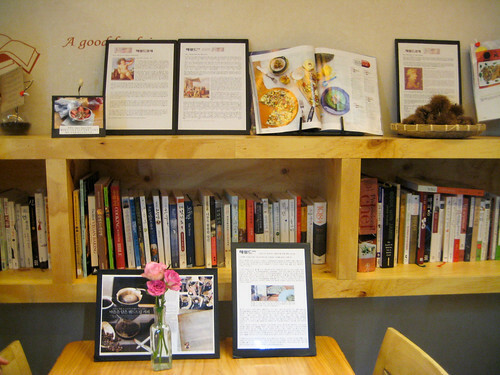 I really liked it when I went the first time because they had a library of vegan/vegetarian/raw cookbooks for me to browse through, but for some reason, they didn't have any vegan options on their food menu and they didn't have soy milk for their lattes either. 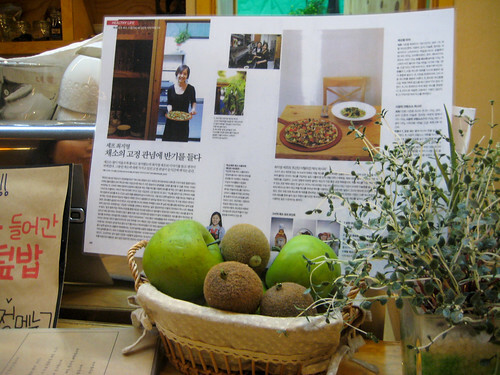 That was kinda surprising, considering that they were promoting their cafe restaurant as vegetarian/healthy/eco-friendly. 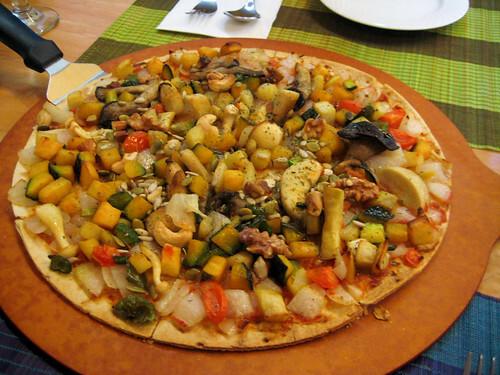 So when I went there with Eunpah last December, we shared this big "채소밭" pizza, which roughly translates to "veggie garden pizza." We were amazed at all the different toppings and actually counted them for a total of 15 individual ingredients, without including the tomato sauce base and the herbs! Dayam it was gooood. All the ingredients were delicious eaten together, but they were also just as good individually on their own. 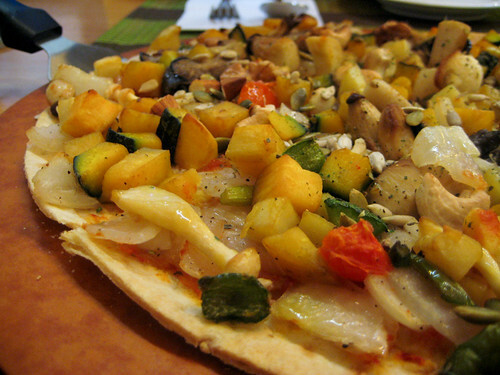 I'd also never had nuts on pizza before, which I thought was nothing short of brilliant. 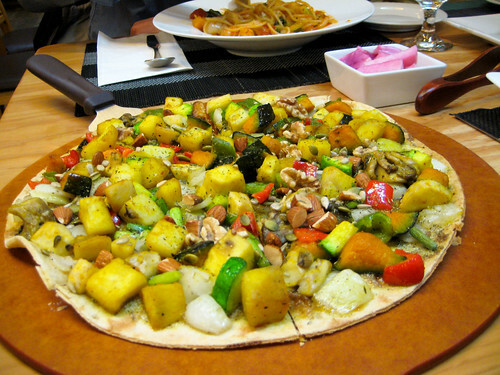 The pizza is definitely on the pricey side (25,000 won), but considering all of its quality, expensive ingredients such as walnuts, almonds, pumpkin and sunflower seeds, I think it's worth it. And it's big enough for 2 people to share. I'm definitely a thin-crust pizza kinda girl, and this was excellent. It's different from the usual doughy crust in that this one has more of a crispy shortbread quality to it. Yum. In addition to the vegan pizza, we all ordered our own individual dishes. 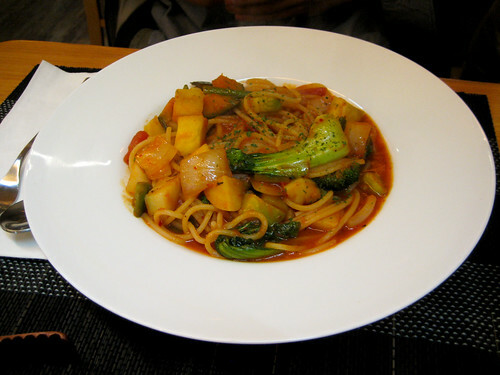 Chris got their 'Vegetable Pasta' dish (15,000 won). I just had a taste of the sauce which was really nice. 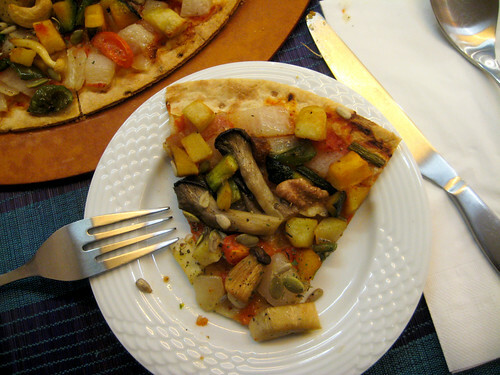 It was just a basic tomato sauce with a mix of veggies, but still flavorful, with 'clean' flavors, and a healthy-feel to it. 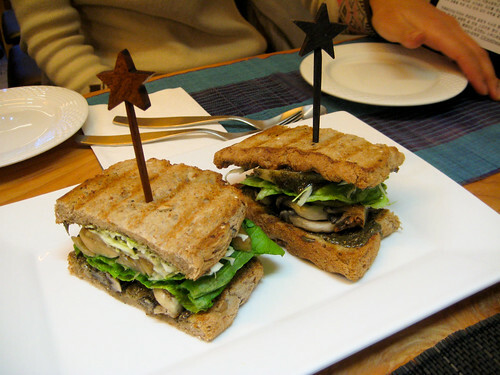 Yunseo went with the vegan version of the 'Basil Pesto Vegetarian Sandwich' (8,500 won). The original sandwich comes with cheese, but we just omitted that and confirmed with the waitress that the bread was vegan. I'm partial to anything with basil pesto, and this was no exception. The pesto imparted great bold flavor, the grilled mushrooms and veggies were juicy, and the bread was nice and wholesome. All in all, one superb hot sandwich. 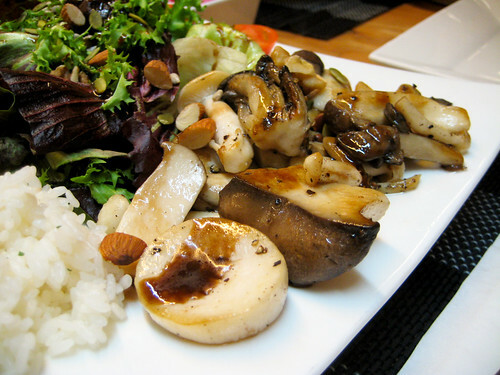 After much indecision, I ordered the Grilled Mushroom salad (15,000 won). Normally, it comes with brown rice, but they only had white rice at that time, which was a little disappointing, but I went with it anyway. And boy am I glad I did! Not only did it come out on this huge platter for maximum 'wow' effect, but everything on it was delicious. 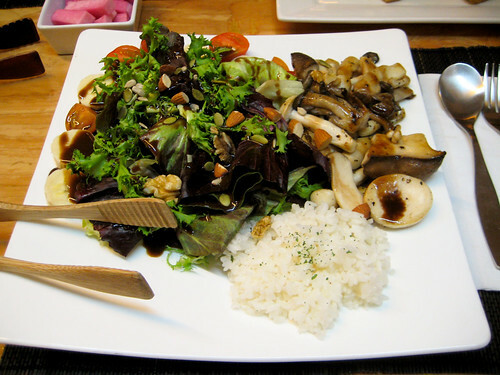 Surrounding a generous bed of mixed greens, there were about 3 different grilled mushrooms, chopped baby tomatoes, and banana slices (yup, bananas in a salad! ), and then on top, there was a generous sprinkling of almonds, walnuts, sunflower and pumpkin seeds. Everything was then drizzled with lots of balsamic vinegar reduction dressing. Despite being stuffed on all the food we ordered, I reeeeally wanted to get their vegan citron pound cake (유자파운드), but they were all out! Boooo~ I think they're only just starting to include vegan baked goods on the menu, so they don't yet have many options and the supply is limited and unpredictable. Hopefully it will become a more regular menu item in the future! Here's their hot clementine tea. 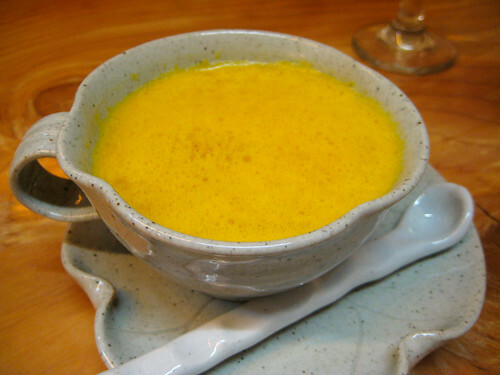 This was basically fresh clementines blended to a frothy juice, and then heated up like a hot tea. Totally delicious, healthy, fresh yet warm, sweet and sour, all at the same time. 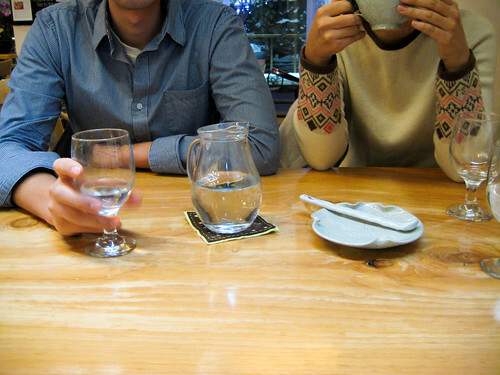 It was a really wonderful night of catching up with dear friends and enjoying good food. Now that So True is so vegan-friendly, I know I will be coming here a lot more, not just for dinners, but also for their soy latte & lunches (they have yummy-sounding vegan lunch specials). Wifi available too. Directions to So True: Cheongdam Station Line 7. Exit #2. Come out the escalator and follow the road as it veers to the right. Walk about 1 minute, and 'So True' will be on your right.